Sorry, you can only order up to 17 units of this product! 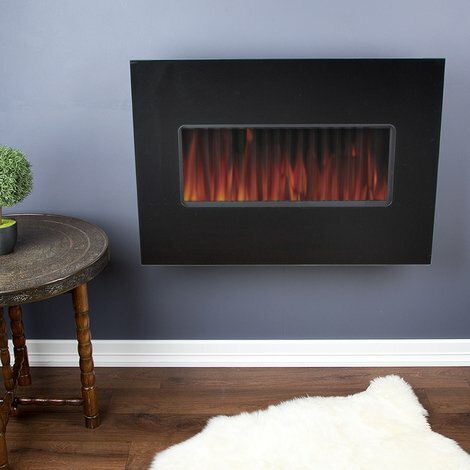 This wall hung gas feature fire would look great in any living room with its stylish textured black design. It would make a stunning focal point in your room as well as providing much needed heat during the winter. This product uses a flame effect adding to the authentic style of a natural fire. This product is a 4kW flame effect fire. The heat comes from the front of the fire. A remote control is included with this product for ease of use when relaxing. Dimensions: (H) 690mm x (W) 850mm x (D) 146mm. Inner Panel: (H) 25.5cm x (W) 62cm. Glass Panel Thickness: 5mm. Note: This feature fire does not come with a mantle, hearth or back panel as they are not needed. This gas fire requires a chimney with a pre-fabricated flue.